As fall approaches, life seems to kick into high gear and we get busy. But, that doesn't mean we can't still make delicious and healthy homemade dog treats for our special companions. For October, I wanted to give you a quick and easy fall favorite. This Double Sweet - Sweet Potato Dog Cookie only has five ingredients, most of which you may already have on hand in your dog treat pantry. 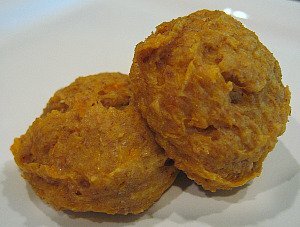 The sweetness in this easy dog treat recipe comes from the natural sugars of sweet potatoes, honey and applesauce. You can quickly make this a wheat and gluten free dog treat recipe by substituting the wheat flour for oat flour, potato flour or brown rice flour. Although the end dog treat is in a rounded shape, you don't have to leave them that way. My taste testers seem to love a soft dog treat, so I tend to make soft treats that break apart easily. However, you can flatten the rounded dog treat dough and bake a round dog cookie that will be more dry and chewy. To save time, or to mix up this recipe, you can substitute canned pumpkin for the sweet potato. You will want to use pure pumpkin, not pumpkin pie filling. Use about one cup of canned pumpkin for the large sweet potato, or mix and match the two veggies for a fun twist on this fall time treat. "If you don't want to roll out dog treat dough, just shape it into a log and refrigerate for an hour or so. Slice with a knife or dental floss." Thank you so much Amy for taking the time to share this great tip for baking dog treats. Share your dog treat tips with your fellow bakers! We know you have lots of great ideas and ways of making treats. Share your tips and they just might be featured in our newsletter. You're so careful with everything your dog eats, healthy food, purified water, and of course the best homemade dog treats. You turn your back for a moment and he's gotten into some chocolate. You may know that activated charcoal can help a dog who has ingested chocolate. But in an emergency, few of us think clearly. How much do you give, when and how do you give it to him, and if all of that works, what next? That's when having dog health insurance comes in handy. Life is uncertain, no one ever plans to go to the emergency room with their dog. That's why having coverage will give you peace of mind, and allow you to put all of those "What If's" to rest once and for all. Get a free quote for your dog, puppy or shelter or rescue dog today, you won't regret it. Our new website design is finally complete! It has been an exhausting job, but we're so excited about being more organized, and having more fun with homemade dog treats. You may see a page with the old look as I'm sure a page (or two) was hiding as we "cleaned house". If you see any errors, mistakes or missing links, I would really appreciate it if you would use my contact us form to let me know.